1As of July 31, the federal government’s total debt stands at $19.845 trillion, according to the Treasury Department’s monthly reckoning. Nearly all of it is subject to the statutory debt ceiling, which is currently set at just under $19.809 trillion. As a result, as of the end of July there was just $25 million in unused debt capacity remaining. 2 The nation’s debt is now bigger than its gross domestic product, which was an estimated $19.23 trillion in the second quarter. Debt as a share of GDP rose steeply during and after the 2008 financial crisis. Since 2013 it has equaled or exceeded GDP, which had not been seen since the end of World War II. 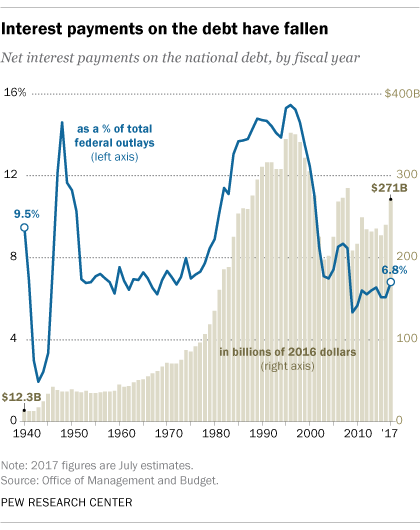 4 Net interest payments on the debt are estimated to total $276.2 billion this fiscal year, or 6.8% of all federal outlays. (The government projects it will pay out about $474.5 billion in interest in fiscal 2017, which ends Sept. 30. But that includes interest credited to Social Security and other government trust funds, as well as a relatively small amount of offsetting investment income.) 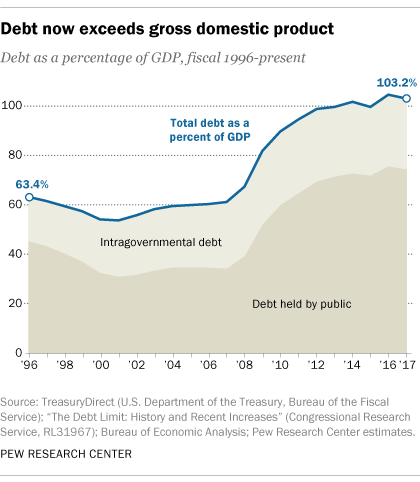 By comparison, debt service was more than 15% of federal outlays in the mid-1990s; the share has fallen partly because lower rates have held down interest payments, but also because outlays have risen substantially: up about 27% over the past decade. 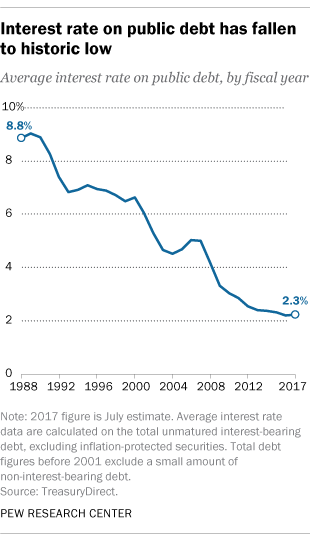 5 Largely because of the Federal Reserve’s previous efforts to keep interest rates low during and after the Great Recession, the U.S. government is paying historically low rates on its debt. 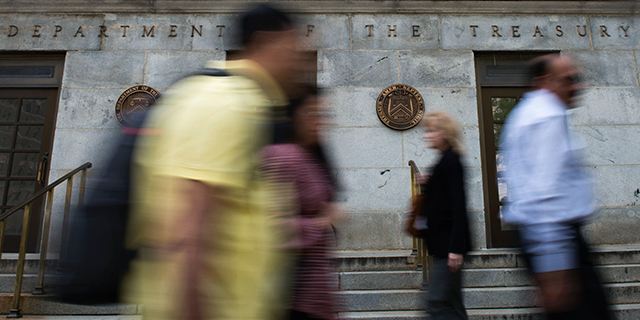 In fiscal 2016, according to the Treasury Department, the average interest rate on the public debt was 2.232%; while the Fed has begun nudging rates higher, the average interest rate in July was still just 2.279%. Though you might think such low rates would put off investors, U.S. government debt is considered to carry very little risk, and historically demand for it has remained strong. But the looming debt-ceiling crisis may be changing that dynamic, especially for short-term securities. BONUS FACT: Though many people may believe that “China owns our debt,” as of June (the latest month available), mainland China only held about 5.8% of the total debt, or about $1.15 trillion. (Hong Kong, a “special administrative region” of China, held another $202.6 billion.) China was the top foreign holder of Treasury securities, ahead of Japan, which held just under $1.1 trillion. Note: This is an update to a post originally published on Oct. 9, 2013.